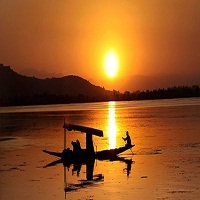 "Dal is a lake in Srinagar (Dal Lake is a misnomer as Dal in Kashmiri means lake), the summer capital of Jammu and Kashmir. The urban lake, which is the second largest in the state, is integral to tourism ." The "Jewel in the crown of Kashmir" or "Srinagar's Jewel". The lake is also an important source for commercial operations in fishing and water plant harvesting The shore line of the lake, is about 15.5 kilometres (9.6 mi), is encompassed by a boulevard lined with Mughal era gardens, parks, houseboats and hotels. Scenic views of the lake can be witnessed from the shore line Mughal gardens, such as Shalimar Bagh and Nishat Bagh built during the reign of Mughal Emperor Jahangir and from houseboats cruising along the lake in the colourful shikaras. During the winter season, the temperature sometimes reaches â��11 Â°C (12 Â°F), freezing the lake.